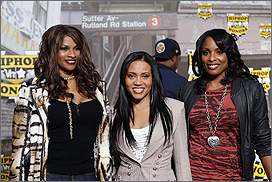 LOS ANGELES (CelebrityAccess MediaWire) — A planned Australian tour by the female hip-hop group Salt n' Pepa has been scrapped due to the group's management being unable to find what they describe as a "credible promoter." An email was circulated by a representative from Spoonz Music Group, an authorized agent for the band, which claimed that the tour had been canceled for a number of reasons. A 50% deposit for the tour had yet to be paid by the tour promoter in Australia and round-trip flights from the US to Australia had not been booked for the performers and their retinue. Additionally, hotel confirmation, work visas and the remaining balance of the full guarantee amount had yet to be paid three days before the performers were slated to head down under. A spokesman for Salt n' Pepa's management did not respond to followup questions about who, exactly, the Aussie promoter in question was.